After looking at several options and following an in depth consultation with our technical surveyor, they opted to have installed 3no. Antiguan external roller blinds, fitted with a heavyweight solid blackout fabric. The key feature and USP of the Antiguan blind is the locking mechanism contained within the side channels that the blind runs within – this physically holds the fabric in place at every position and renders the blind windproof, unlike most external roller blinds where the fabric is guided by a wire and subsequently flaps around in the wind (which another company had put forward as the solution for this clients requirements, which clearly it was not). Additionally the slim, sleek hardware of the blinds which was colour co-ordinated to match the aluminium frames of the sliding doors blended seamlessly. 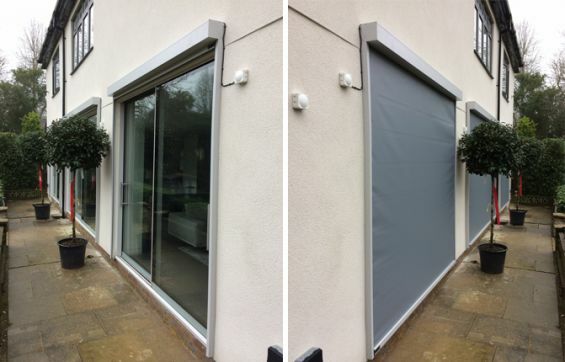 The fabric was selected in a contemporary mid grey colour, treated with a self clean effect coating to ensure it stays clean and operation was via built in tubular motors contained within the headbox of the blinds operated from a radio remote control able to be operated from anywhere in the house. “ I just wanted to drop you a line to say thank you. You guys have been amazing to deal with throughout. The blinds look better than I ever expected and I will be recommending you whenever I can. My father was at the property whilst the works were being done, and he is difficult to please, but even he was very complimentary about the team.